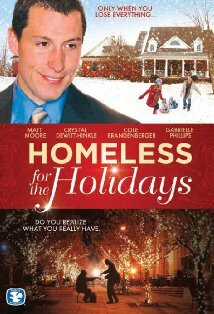 **As a BuzzBlogger for www.teambuzzplant.com I was given the opportunity to review the movie Homeless for the Holidays. This is the first product/movie review that I’ve ever written, so I hope I do this correctly! Homeless for the Holidays is a story about Jack Baker a busy executive who doesn’t have enough time for his family. Jack is very blessed and has a nice lifestyle but he isn’t at all generous. He loses his job but remains loyal to his former company believing that they’ll hire him back. Eventually Jack is forced to accept a low-paying and humiliating job to try to support his family. This film is based on the real life experiences of writer/director/producer, George A. Johnson. Throughout this movie I saw the effects that unemployment has on a marriage and a family. The Baker family’s experiences are very real and it’s easy to relate to their situation. Despite the fact that Jack begins as an unlikable character I was able to quickly empathize with him and his family and hope for a happy ending. At the beginning of the film I wanted to smack Jack and by the end of it I was crying. I especially liked how the Baker family came together and formed a closer bond through their hardship. The Baker children express the very real truth that what kids really value is love and attention from their family. As the film progresses and the characters evolve I saw much kindness, generosity, and a true spirit of giving. It’s a timely reminder as we approach this season that often times is so commercial and promotes a spirit of greediness. Despite the film’s subject matter it wasn’t depressing like I originally thought it might be. There are quite a few humorous moments throughout the film. Even without the humor the examples of kindness displayed later in the film more than make up for any “darker” moments there might be. You will certainly walk away from this movie encouraged (I know I did…and a little inspired too!). A Christian message is present in this film as God and church are mentioned throughout. This film does not have a strong (if any) salvation or gospel message and that is not the purpose of the film. In contrast to the negative attitudes that are displayed earlier in the film it also contains examples of Biblical virtues such as patience, kindness, and generosity. I also saw loyalty, hard work, and perseverance. The acting in the film was okay. It wasn’t wonderful but it wasn’t terrible. It was on the level of many movies that I’ve seen on The Hallmark Channel during Christmas. It was superior to many other Christian films that I’ve seen. The back of the DVD case said that the DVD features include Deleted Scenes, Production Diary, Auditions Highlight Reel, Scene Index, and Commentary with Writer/Director/Producer, however, the features were not included on my copy of the DVD so I am unable to comment on them. There were outtakes that played during the credits and while they were entertaining I was a little unprepared for them as I was still crying processing the positive message that the film left me with. If you plan on using this film as an aid to teach others about giving or to simply inspire and encourage the spirit of giving within them…you might want to turn off the DVD before the outtakes begin so that the message isn’t lost. I really liked Homeless for the Holidays and I’m certain we’re going to add this to our collection of Christmas films to watch each year. This movie fit in great with my blog purpose in that it showed a family having fun together and creating new traditions in the simplest way during the most difficult of times. This movie is a great tool for teaching children about giving and caring for others. Homeless for the Holidays is such a good reminder to be thankful for what we have, to give God the glory in all things, and that we always have the ability to be generous and giving to others despite our financial situation. Homeless for the Holidays was awarded 5 out of 5 Doves Seals by the Dove Foundation. **As a BuzzBlogger for www.teambuzzplant.com I was given a free copy of the DVD “Homeless for the Holidays” to watch and review. I was not asked or obligated to write a positive review. All thoughts and opinions I’ve written regarding this film are my own and were not influenced by receiving the product for free. Posted on November 22, 2010, in Reviews and tagged reviews. Bookmark the permalink. 7 Comments. Thanks for a good review. I will be on the lookout for this film. I just stopped by from SITS to say hello; hope you will find time to do the same. Great site. Can’t wait to read more. I’m a follower now. You did a good review. If it’s like a Hallmark, try using tissues as your marker for success. This one would be a “5 tissue” movie. I had been wondering about this movie. I saw it over on amazon. Thanks for sharing. Nice job on your review! I love how you brought us along the emotional ride through the movie. 🙂 Keep up the great work!